As a pool owner you know by now that an unheated swimming pool is only comfortable during the peak of the summer months. Most swimmers feel comfortable at around 80° F and children require even higher temperatures to be able to swim any length of time without shivering. If your pool is not being heated and is only useful for a few months each year, it makes sense to invest in a solar heating system to increase the usefulness of your investment in the pool and pool maintenance. If you want the pool temperature to be higher than nature wants it to be, you must heat it on virtually a continuous basis. A Sun Ray Solar pool heating system will do just that. It will collect the suns free energy and pour the collected heat into your pool day after day, year after year, so you, your family and friends will fully enjoy your swimming pool. 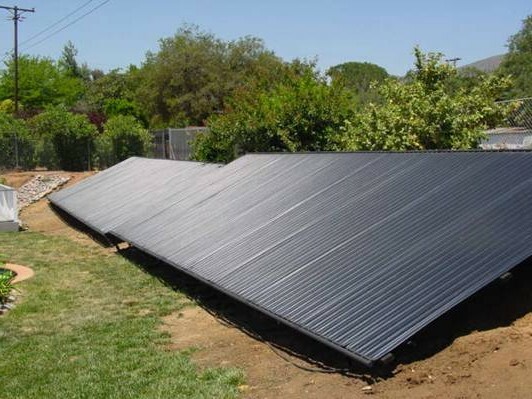 The performance of your system is directly proportionate to the surface area of the solar panels. The surface area is determined by the size of your pools geographical location, and the panels orientation to the sun. In the sun belt area, the requirement surface area is equal to 50% to 80% of the surface area of the pool. More than a minimum requirement will increase the ability of the system to heat your pool under marginal weather condition. 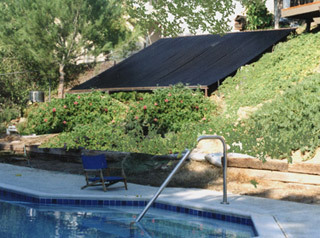 A plastic pool cover can be used to keep the heat collected by the solar system from being lost during the colder nights. It's The Real Thing: Sun Ray's Pool Panels are metallic heat exchangers especially engineered to absorb solar energy efficiently. Better Performance: Sun Ray's metallic (copper tubes, aluminum absorbers) Pool Panels absorb and transfer solar heat at a much greater rate then plastic or rubber, the result is a better performance. Weather Resistant: Sun Ray's Metallic Solar Pool panels withstand UV-radiation, hot or cold weather. The material will not break down with prolong exposure to the sun. No plastic or rubber panels will last as long. Quality always costs less in the long run. That's why Sun Ray Copper Pool Panels are the best choice. The Sun Ray pool heating system is adapted to your existing circulation and pool filtration system. A large flow of filtered water is circulated through the solar heat collector panels which are exposed to solar energy and transfer the heat collected to your pool. 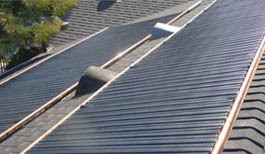 An automatic or manual valuing system is added to divert the water to your solar pool collectors when heat is available. Since the solar heating system is part of your pool circulation and filtration system, your pump timer is set to operate during the sunny hours of the day. Your Sun Ray pool heating system will free you from the need to heat your pool by any other means during most of the year. Maintenance: There is no special maintenance required. A chlorine or bromine level at around 2 ppm and a pH of 7.7 are good levels for swimming comfort and are perfectly compatible with Sun Ray copper panels. Add chlorine directly to the surface of the pool to dilute concentrated compound. Freeze protection: It is good practice to install the solar collectors above the water level of the pool and to allow the collectors to completely drain during the night or when freeze conditions occur. If the collectors must be installed below the water level of the pool, a manual valving system must be installed to allow the proper drainage during the cold season. Your Sun Ray Solar Distributors are highly trained and carefully selected independent solar professionals. Using Sun Ray Solar pool panels, they can design and install a reliable high performance, cost-efficient system to fit your individual needs and requirements.